Seattle is just 30 minutes away from Wine Country. Woodinville is located in the Sammamish River Valley and feels more like rural farm country than a city suburb. With 90 wineries and tasting rooms representing every AVA in Washington, it’s a quick trip that provides instant access to the state’s fantastic wine catalog. 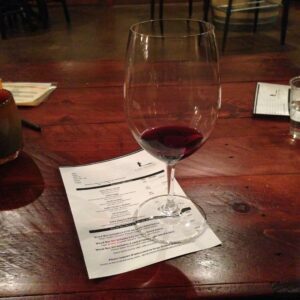 Recently, our friends invited my husband and me on a quick trip out to Woodinville for some wine tasting before dinner. Considering I grew up in Kirkland, about 15 minutes away from Woodinville, you’d think I was more familiar with the winery scene that has developed there. However, I had never actually been to Woodinville for the sole purpose of drinking wine. We drove out of the city, across Lake Washington, and in no time we pulled up to a row of tasting rooms – all run by fantastic Washington wineries. Since we were just there for a quick tasting, we stopped in at our friends’ favorite spot – Long Shadows. After sitting down on some comfy couches, we were poured a selection of wines from their collection. The staff at Long Shadows were incredibly knowledgeable and approachable. The wines were spectacular (in fact, we purchased a few bottles to take home). Sitting on a soft leather sofa, sipping some great wine, chatting with friends – it doesn’t get much better. If you’re visiting Seattle and have an afternoon to spend sipping some fabulous wine, a trip to Woodinville is an easy choice. With the proliferation of Washington State wines on the global scene and the incredibly high standard of wines produced here, these wineries are ones you will want to be familiar with. 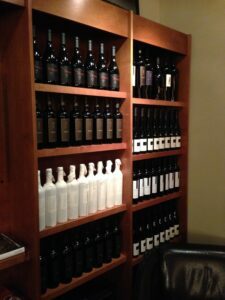 For more information on Woodinville’s wineries and tasting rooms, check out woodinvillewinecountry.com. Looking to find them all in one spot, at one time? Taste Washington is the nation’s largest single-region wine and food event and features 225 wineries, local restaurants and wine seminars in downtown Seattle the weekend of March 29 & 30. Highly recommended if you’re looking to jump start your Washington wine knowledge! Kristen Star was a former Marketing Manager at Visit Seattle. She is a music-loving, craft beer-drinking, almost native Seattleite. Her favorite way to spend the day is restaurant-hopping around town, usually starting close to home in the Pike Place Market.